Hall manager Nuala with volunteer Christine. Every second Sunday of the month, Christchurch Hall at Sandymount Green plays host to the Sandymount Market, where you are invited to sample the best of local food, art and fashion. The market has been going for about four years now and attracts an array of colour, texture and taste, which serves as the backdrop to what has become an exciting social outlet for many of the stallholders. Una is a designer who loves meeting people and talking fashion. Alongside her is photographer Ger Power, who is a purist photographer, selling prints of her worldly travels. Claire and Maura at the knitting stall always look online to see what is on trend and are thinking of starting a knitting class to coincide with the market. Nicole Groth is originally from Germany, and uses beading to relax after work. The result is a beautiful jewellery collection. Tony found that his part-time job was becoming a full-time job when he began importing silk scarves from Asia, and it took off from there. “I started laughing when it was suggested at first, but it’s a couple of years on and I’ve stopped laughing,” he tells NewsFour. The owl trend is evident at the Beads 2 Be Beautiful stall, where Anita tells NewsFour about working with semi-precious stones and last year’s trend: skulls. Geraldine tells us about 88 Food company, which derived its name from the lucky Chinese number. “You can turn it upside down or inside out and it’s always the same.” They are a HSE-registered home producer, using local ingredients wherever possible. The most popular sellers are the sweet chili relish and mango chutney. Artist Heather Moulton says, “I always thought that I would be sitting reading a book from cover to cover when I retired, but it hasn’t happened yet.” She paints with oils and makes 3D pictures and hand-made greeting cards, and is kept very busy. 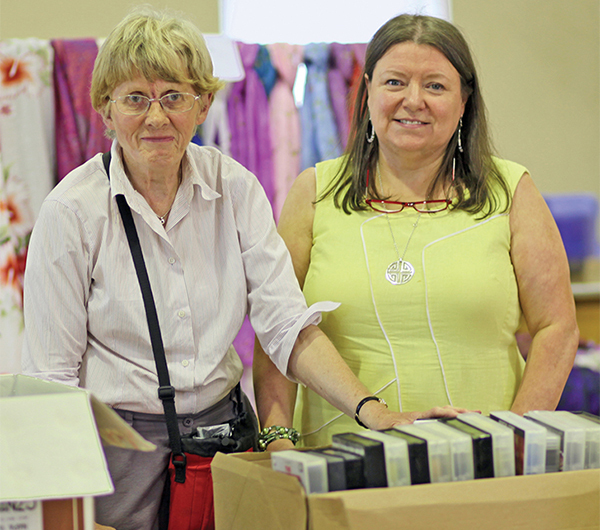 As well as selling her home-made jams and marmalades at this market, Maud Wilks organizes tombola at other locations, the proceeds of which goes towards various charities, including the Jack and Jill Foundation. “My nectarine jam was a mistake, as I thought they were peaches,” she reveals. It’s a happy mistake though, as they all sell. There are so many stalls that there is barely enough time to talk with everyone. Among the stalls briefly encountered were the Artists, Designer Glasses, Botanical Painter Janet Bockett and the amazing benefits of the aloe vera plant in the form of Forever Living Products. Hall manager Nuala tells NewsFour about the origins of the craft fair. “The hall is used by various groups during the day, but we felt that the fair would advertise our presence a bit more and at the same time raise funds for the church. We have just had our 150-year anniversary a few weeks ago.” Sandwiches, cakes and refreshments are available from the kitchen, for those wishing to sample the delights of the fair. For further information on the craft fair or for any of the groups using the hall contact 087 978 8763.